Each year, at Blue Lake Suzuki Family Camp, she requested the same teaching cabin which she transformed into another world. 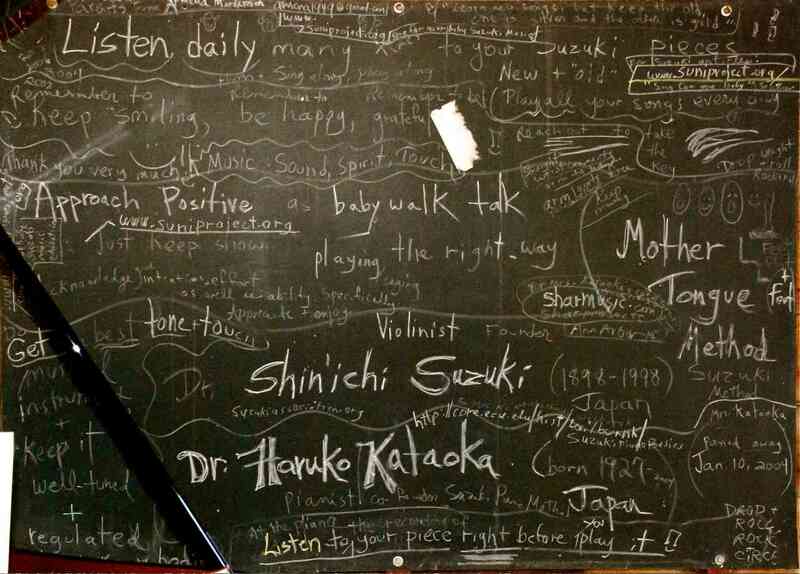 A blackboard on the wall collected sayings and information added by Armena each year about Dr. Suzuki, Mrs. Kataoka and the Suzuki method. Throughout decades of teaching and the literally thousands of Blue Lake Fine Arts middle and high school summer campers using these facilities as orchestra, band, choir, dance, theatre and visual art students, this blackboard has miraculously remained untouched by others! Armena Marderosian, much-beloved Suzuki piano teacher, teacher trainer, colleague, wife, mother, sister and friend, died peacefully at home on November 3, 2012 after a seven and a half month struggle with cancer. Armena was born in Providence, Rhode Island, and later moved to suburban Philadelphia with her parents and older brother and sister. At age six she begged her mother’s piano teacher to also teach her. Thus she began her lifelong study of the piano. Always the explorer of new territories and new ideas, Armena enrolled in the Oberlin Conservatory of Music, rather than attending college in Philadelphia, as did her two siblings. She started Oberlin as a piano major, studying with Miles Mauney. In Armena’s own words, “Two years later I transferred to the College. It was an exciting time [the late 60’s] and I wanted to study everything—anthropology, politics, economics, history, art, biology, dances, and eastern religions, and I majored in French.” Armena’s Armenian heritage was always central in her psyche; when a friend informed her that an Armenian professor, Ron Suny, was in the history department, she lost no time to introduce herself to him. The introduction consisted of a note to him in Armenian, with a request that the note be returned to her. It was, with corrections on her Armenian grammar and syntax! It took another year for their friendship to develop and deepen. In 1971 they were married, just in time to spend their honeymoon on one of Ron’s many academic exchange programs, this time in Yerevan, Armenia, then part of the Soviet Union. This exchange program was only the first of many of Ron’s appointments around the globe; Armena accompanied him on many of them. Upon their return to Oberlin, Armena continued her piano study and was introduced to the Suzuki piano method by Gretchen Hazen Smith. Gretchen herself had studied with Haruko Kataoka in Matsumoto, Japan. In the 1970s Mrs. Kataoka trained teachers in the United States in Oberlin. This is when Armena’s long relationship with and admiration for Mrs. Kataoka began. She remained influenced by Mrs. Kataoka’s emphasis on Twinkle technique and tone production. When Gretchen left Oberlin she bequeathed her studio to Armena and to Pat Jackson, the other Oberlin Suzuki piano teacher. Armena ultimately was able to spend four months in Matsumoto, meeting and studying with Dr. Suzuki and with Mrs. Kataoka. The observations and discussions there had a profound influence on her. Dr. Suzuki said to her, “One child, one parent, one teacher, bad environment. You have to have families come together for lessons.” This key learning was at the center of her teaching philosophy. 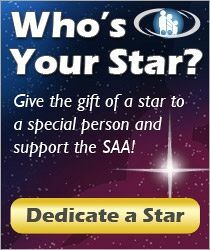 In 1978 Grikor Martiros Suni was born in Ann Arbor, Michigan, but, sadly, died two years later of hemolytic uremic syndrome at the beginning of a year-long stay in Boston. This was a profound loss that colored Armena’s and Ron’s life, though they subsequently added to their family two healthy daughters, Sevan and Anoush. In 1981 Armena and her husband Ron moved to Ann Arbor. She and Ron and the girls spent two sabbaticals in Palo Alto and countless trips to Armenia, Russia and the Middle East. When it’s not their turn at the piano, sometimes they actively participate in a lesson point, other times they can pay attention directly or indirectly, lay on the three big stretching/exercise balls, play with all the music notation materials on the floor under the grand pianos, write songs, even (for older kids) do necessary school homework, or rest. My blind student will jump. Or lay on and off the couch. I ask the student at the piano to sit perfectly and pay attention. The kids not at the piano are free to move around. If I need to ask for more quiet, I do. Armena focused on posture. 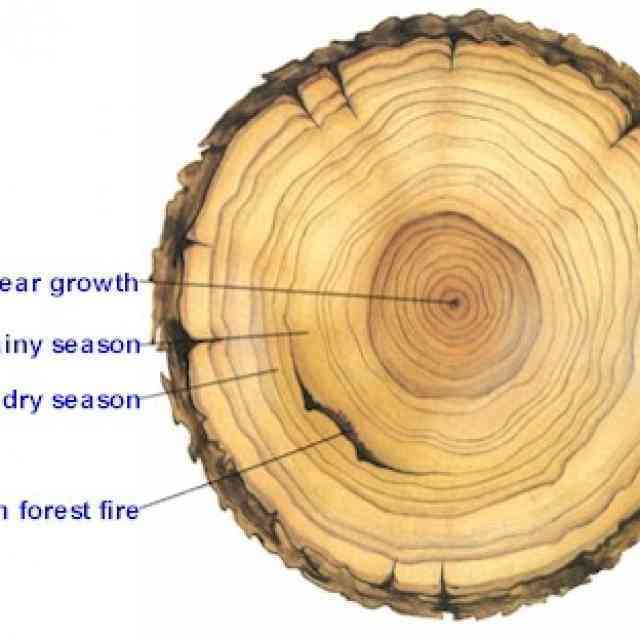 “Be a tree” was a common admonition to her students at the piano. She was insistent on maintaining a coordinated hand position for herself and for each student; her personal research on how best to play the piano led her to take lessons from local teachers who follow the approach of Dorothy Taubman. The intensity of her curiosity continued to the end of her life. Michiko Yurko recalls a telephone call with Armena a week before she passed. The phone conversation centered on Twinkle technique—that perennial question! She was proud of being a Suzuki method teacher. Often at concerts, when a piece was performed that is in the Suzuki books, she would say to me, “That’s one of our pieces!” At the same time she encouraged the exploration of other literature by herself, students, and colleagues. Armena’s Armenian heritage continued to be integral to her being her entire life. In 1992 she began work performing and reviving the music of her husband Ron Suny’s grandfather, Grikor Mirzaian Suni. She loved to perform and promote the folk-like music of Grikor Suni. In 1997 she performed on and produced the CD Armenian Songs of Grikor Mirzaian Suni (1876-1939): Vocal Solos and Duets. That CD is available online through www.suniproject.org . She performed Suni’s music in concerts in Michigan, Pennsylvania and California. One of the many venues for Armena to showcase the music of her grandfather-in-law was at the Blue Lake Suzuki Family Camp’s faculty recital, held every year in June. The Suzuki camp at Blue Lake Fine Arts Camp was an annual tradition for Armena and her daughters, Anoush and Sevan. Almost every year Armena taught at the camp, always in the same cabin. When Anoush and Sevan were young they were brought along and they became part of the Suzuki faculty family there. For her it was a week of warmth, of learning, of sweet nostalgia. 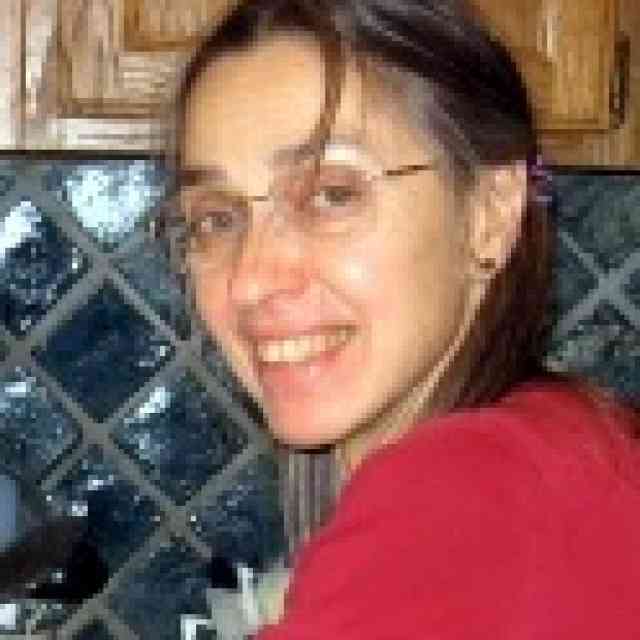 Donations in Armena’s memory may be made to The Suni Project, 1723 Wells Street, Ann Arbor, MI 48104-3601 to support further research on Grikor Mirzaian Suni or to Armena Marderosian scholarship, c/o 3838 Cordes Ave NW, Constock Park, MI 49321 for piano scholarships for Blue Lake Fine Arts Camp Suzuki Family Camp. Renée Robbins maintains an active piano studio in Ann Arbor, where she teaches piano students of all ages, trains other Suzuki teachers, and performs chamber music with a variety of other musicians. She has taught at Suzuki workshops in all corners of this country and internationally. She holds a BA from the Eastman School of Music in piano performance, an MSW in social treatment from the University of Michigan, and an MA from Eastern Michigan University in piano accompaniment. 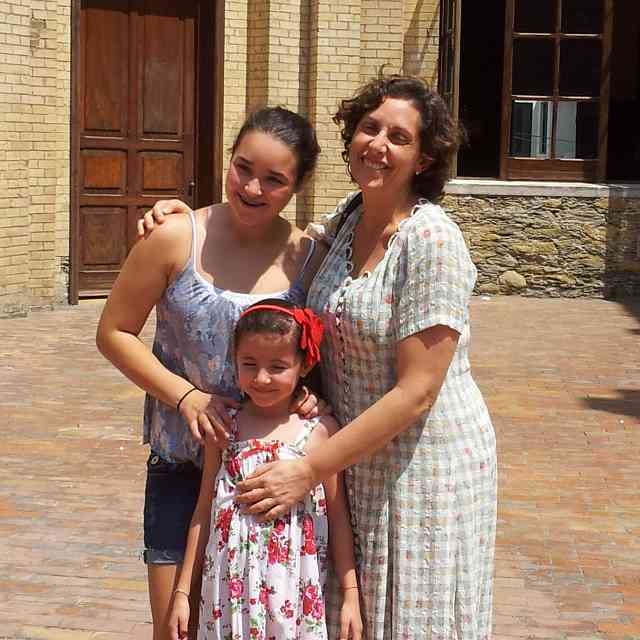 Renée has studied piano with José Échaniz and Joseph Gurt, as well as at numerous chamber music workshops. Reneé’s teaching style has emphasized high pedagogical standards, while attending to the inner life of each child; lots of good humor; and the building of community within her studio.